Marketing Gifts: Brand Promotion: Why Should You Use Inflatable Neck Pillows? Brand Promotion: Why Should You Use Inflatable Neck Pillows? Want a unique marketing gift idea? Why not offer both portability and comfort to your customers by giving away this custom inflatable neck pillow. The neck pillow is designed in the shape that is comfortable with your neck. The material in this neck pillow is very light. This is perfect for avid travelers who would like to travel in both comfort and style. A promo gift like this is such an interesting marketing gift idea and your customers will definitely be rushing down to get their hands on this interesting marketing gift! Why Should You Use Inflatable Neck Pillows? One of the most important parts when choosing the perfect promotional item for your business is the branding space. A custom inflatable neck pillow has a great branding area on the cover, to print your logo, your artwork or your products on it. Along with this, the common use of travel pillows are during vacations, the marketing potential is huge. Using a branded travel pillow during the vacation, your customers will unwittingly connect the fantastic feeling of the holidays with your brand. This way you can enhance customer retention and your product awareness. 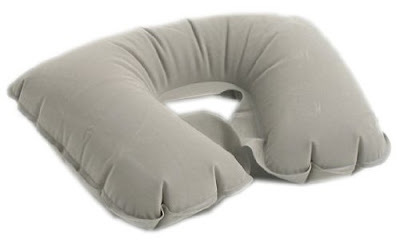 Lastly, the most amazing part is knowing that this travel pillow is inflatable. It's really portable and lightweight. It could easily fit in your baggage, pocket, and purse. It's the perfect travel companion and the perfect marketing giveaway! If this item interests you, please feel free to contact our team anytime. We have a dedicated team that is an expert in marketing and manufacturing, they're always ready to answer all your queries.